What kind of freshwater fish do you recommend for our aquarium? We use several different kinds of fish and choose them to fit your aquarium and requests. How often do you service the aquarium? On basic freshwater systems, we usually service the aquarium once or twice per month depending on it’s design. During setup or if something needs attention, we will come out more often. So what do I have to do to the aquarium? Nothing. We use automatic feeders to feed the fish and timers for the lights. You shouldn’t have to do anything to it. So what else do I have to buy or provide for the aquarium? Aquatic Designs provides all of the equipment, chemicals, and food needed for monthly maintenance. The only extra expense would be if you own the aquarium and a piece of equipment needs to be replaced or a fish dies and needs to be replaced. Does the aquarium smell and is it messy? An aquarium usually does not smell nor do we make a mess when cleaning. For example, we have aquariums in some very sensitive areas at Arkansas Children’s Hospital. If they did, they wouldn’t be there for long. Do you have a problem with children bothering the aquarium? When we set up an aquarium system, we try to keep children in mind. We usually put wooden canopies on top of the aquarium so little hands can’t get in the water. We also put child safety locks on the doors and can do other safety precautions as needed. In our 20 + years of maintenance, we have never had a big problem with children bothering the tank. Our biggest problem with children is wiping lip prints off of the glass. I need a pickled ash stand with arched raised panel doors and decorative molding to match the cabinets in my office. No problem. If we can’t find a stand available commercially, we can build it. And, yes, we built that one, too!! 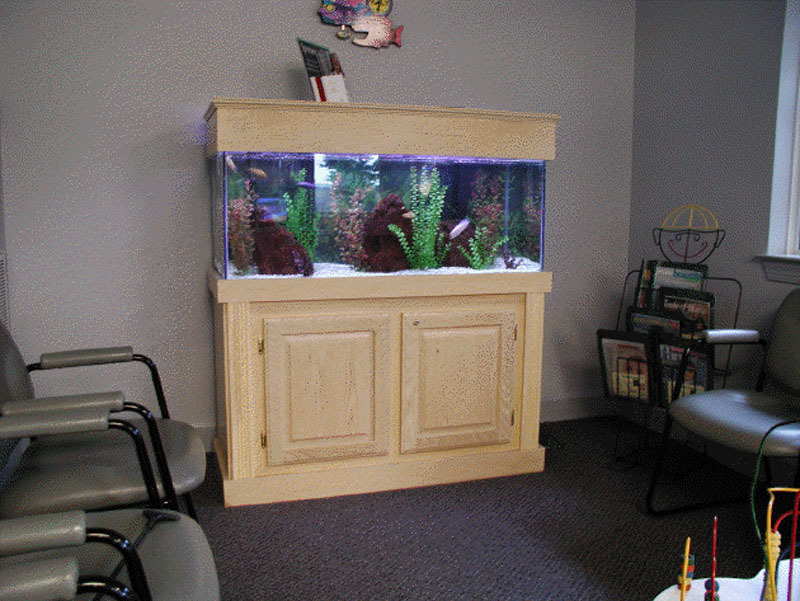 I would like to have an aquarium in the waiting room, but I don’t have much floor space. No problem. 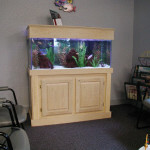 We have aquariums that can fit neatly in a corner or we can customize aquariums for unique situations. Do you provide maintenance for saltwater aquariums? We are no longer accepting saltwater maintenance accounts. It is our opinion that saltwater aquariums are best left to the hobbyist who can give them the TLC they demand. The cost of the aquarium and the fish is much more than freshwater, and the fish are more delicate with a higher mortality rate. We have switched over many of our (and other companies) saltwater accounts to freshwater with not one client regretting it. Do you provide maintenance for homes? We do not provide maintenance on residential aquariums at this time. Still have a question? Please email us and we will answer any questions you might have. Copyright 2018 Aquatic Designs, Inc. All Rights Reserved. This site is not a part of Facebook website or Facebook Inc. Additionally, this is NOT endorsed by Facebook in any way. FACEBOOK is a trademark of FACEBOOK, INC.